HONO GOLF produce specific products, and offering factory price. For download the newest Catalog. Please Click here. For further inquiry price, Please click here. 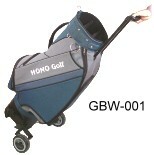 With concealed and stretched-out wheel design, The new idea is to function as golf bag and golf cart in one. Of course able to be used directly on the golf course and Convenient for overseas travel purposes. 1. The hidden adjustable handle was designed by special cast steel structure, which can sustain the weight of the whole club and accessories without any distortion and break while drawing the golf bag. 2. The firmly solid main body of wheel has been tested and used on various landforms repeatedly to ensure that the main body and frame of wheel would not be involved in distortion. 3. The unique wheel pull bar (pull bar knob) can easily control the wheel during usage. 4. When the whole wheels extend, the width is 530mm, and the wheels form a parallel trapeziform plane with the base of golf bag, which makes the bag not easily tilted.